Canvas art ordered from UrbanLoftArt.com is either printed by top apparatus or laminated onto the canvas. 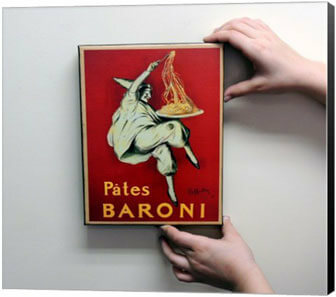 Canvas experts at our facility stretch the canvas art print around canvas bars made of wood. 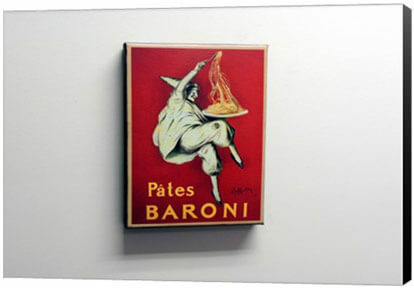 We do not supply nails or other hanging materials for the canvas. To read more about our canvas art, click here. It is important to find a spot on the wall before you choose your canvas. Every small detail is important for this first step. To find a place to hang your canvas, it helps to look at lighting, colors and size. Size is a big factor, if the piece is too big, it will overpower the room. On the contrary, if it is too small, it may go unnoticed. 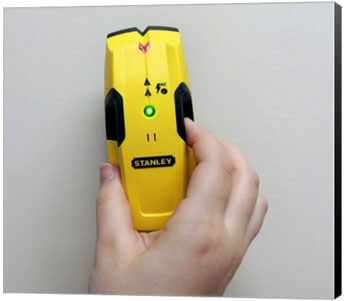 You can use a stud finder to find a stud in the wall. This gives more support when hanging your canvas. 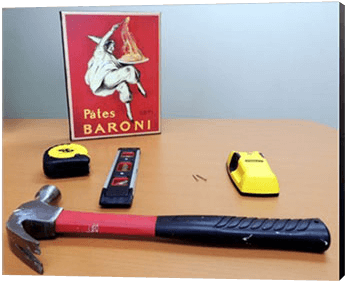 If you hammer the nails into a stud, it will give more support rather than hammering them into the wall. Once you find the perfect spot to hang your canvas, hold the canvas against the wall in that spot. Using the level, make sure the canvas is straight. You want the level to sit on top of the canvas instead of holding it above the canvas so it will be more even. Make any needed changes until the level is showing that the canvas is straight. Remove the level from on top of the canvas, keeping the canvas in place. Using a writing implement, mark above the canvas. 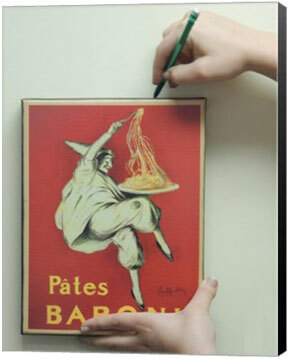 Make sure when you mark it is directly above the canvas to minimize the chance of the canvas hanging askew. 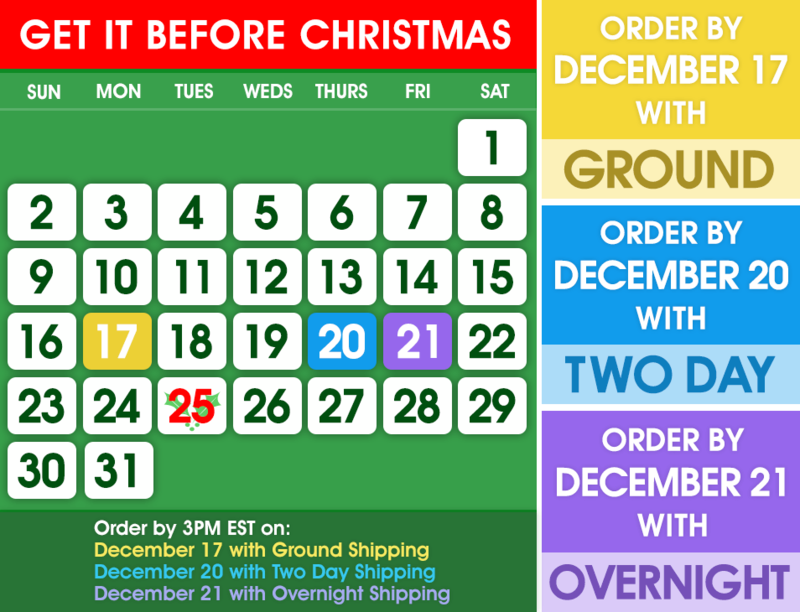 Remember, the canvas will be 3/4 inch or 1 1/2 inches higher than the line you drew (based on your canvas bar size) so you'll want to place the canvas slightly lower than where you want it to hang. Take the first nail and line it up with the mark from step three. 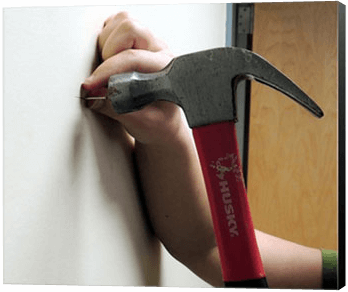 Using the hammer, put the nail into the wall on the mark you made. 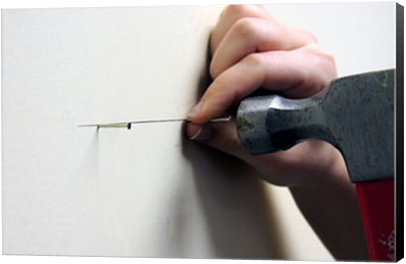 You want to make sure that you do not hammer the nail all the way into the wall so the canvas will have space on the nail to hang onto. Take the second nail and like step four, line the nail up to the mark. 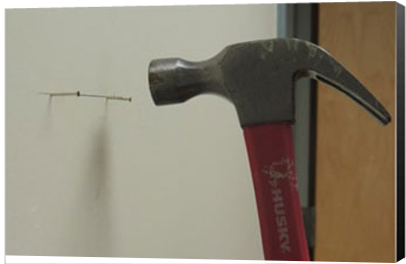 Put the second nail into the wall using the hammer. Like the first nail, you do not want to put the nail all the way into the wall. Make sure to let the nail hang out so the canvas can hang from it. 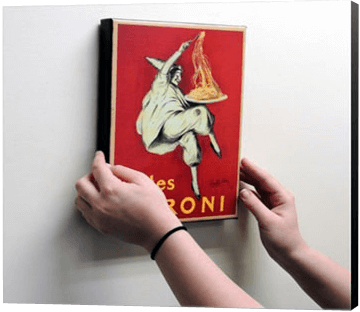 Now that your nails are secure in the wall, you are ready to hang your canvas! Take the canvas (the back facing the wall) and place the top wooden bar of the back of the canvas on top of the two nails. 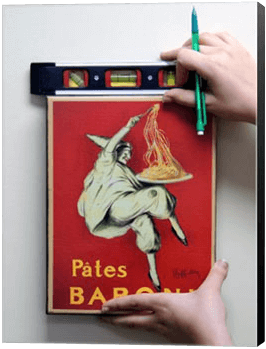 Once you hang the canvas, if it is a bit askew, you can move them slightly up or down to straighten it out. You are done, your canvas piece is finally hung and ready to show off. All our canvas artwork ordered at UrbanLoftArt.com comes with a 100% satisfaction guarantee! Contact our friendly customer service team at 1-888-601-0010 or support@UrbanLoftArt.com. For more information on how to reach us, visit our contact us.